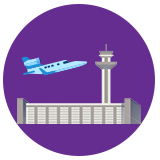 Need a Heathrow taxi from the airport? Call Waterloo mini cabs to book an instant taxi for your Heathrow transfer to across the London. Licensed by Transport for London (TFL), we aim to provide you a swift taxi airport transfer from London airport to airport or to London postcode with our experienced licensed minicab drivers. Waterloo Cars is proud to be a Heathrow Airport Guide Approved Taxi. Serving a premium taxi transfer from Heathrow to Gatwick with budget fares for every traveller. With many years of trade in taxi service we have been rated a best London taxi provider. 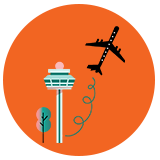 Book with us your Heathrow to Gatwick transfer without hassle and leave the rest to us. Our Licensed taxi driver welcomes you at Heathrow airport with your name sign and takes you safely to your destination. A Central London taxi service which is your best choice for Heathrow to Stansted transfer. Professional and well-mannered chauffeurs and company vehicles for Business executives and tourists. The journey from London Heathrow to Stansted airport approximately 85 minutes. Book your transfer with us and let us serve you an excellent Heathrow to Stansted taxi service. Book your Heathrow taxi transfer to Luton with us by using our instant online taxi booking panel. We serve you a first class, premium and budget taxi transfer from Heathrow airport to Luton. 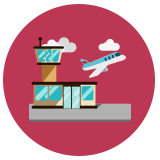 Whether you are travelling to Luton airport or Luton city, let us manage your transfer to Luton with our best fleet drivers. A free meet and greet service is served to all our Heathrow and other airport travellers. Why Book a Taxi from Waterloo to London Heathrow? For the convenience of door-to-door transport Waterloo Cars is as good as it gets and removes the stress from travelling to the airport. We will get you there much faster and much more comfortably than travelling via public transport. Taking a minicab from Waterloo Cars to Heathrow Airport terminals works out much cheaper for a group than taking a coach or train ride and provides the luxury of travelling in their own private mode of transport. It also removes all that dragging of luggage on escalators and stairs which most travellers find stressful. We have been serving taxis from Heathrow airport for many years and we are a Heathrow Airport Guide Approved Taxi service. For a fantastic Heathrow taxi service between Waterloo and Heathrow, make sure to contact Waterloo taxis, cars and minicabs. This professional service delivers every time. 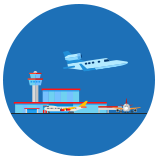 Our drivers will ensure a safe and comfortable journey and make use of real time traffic updates so you make it to the flight check-in time, on time, every time. This private airport transfer service from central London to Heathrow terminals is very affordable, reliable and professional. City breaks have become the norm these days to add colour to those dreary mundane weeks. More and more people are jetting away to a new destination to check out the treasures these far away cities hold. Of course, London is no exception when it comes to plenty of things to do and see. London enjoys millions of visitors pouring into the city each year seeking to enjoy these short breaks. While planning these trips, one of the key things to organise is the prior booking of your taxi. This will prove to be an essential step in making the holiday start off stress free. For a superb taxi service contact Waterloo Cars, taxis and minicabs. When landing at London Heathrow airport it may be daunting for many passengers especially newcomers to the city. How to get from A to B is a lot harder in a new unfamiliar city. Therefore, at Waterloo Cars, we pride ourselves on the professionalism of all our drivers. They will meet you at Heathrow airport arrivals which means you will not need to wait around in lines for taxis or buses. If your flight is delayed, they will have checked in advance and adjust the pick-up time accordingly. Remember, for any size party we offer a full and proficient service with our accommodating fleet of cabs, taxis and minicabs from Waterloo to Heathrow. Book a Heathrow taxi or minicab service to London can be a costly from a different part of the United Kingdom. Most of the time a taxi London Heathrow can cost you more when you book for more than one traveller. Waterloo Minicabs Heathrow taxi service can be booked immediately via our online booking panel in advance. Just let us know your arrival terminal when booking a taxi London from Heathrow airport. Heathrow Airport is the busiest and a major airport in United Kingdom. It has never been easier to get or book a taxi service from Heathrow airport. Waterloo Cars and minicabs is one of the leading cab firm in Central London which offers a fast-online booking system to our airport travellers for a cheap and budget cab and taxi bookings. We serve our clients an excellent service from and to all Heathrow airport terminals. Waterloo Cars is a Central London based Private Hire pre-book minicab service. Offers 24 hours 365 days a year serving cheap cabs near Heathrow airport for many years. Our drivers and minicabs are licensed by Transport for London (TFL). Just email us or call to our Central London minicab office to book your taxi from Heathrow airport to London. We also provide free meet and greet service at all terminals. Looking for a cheap taxi service form Heathrow airport? Look no further than London leading minicab service Waterloo Cars, providing minicabs to Heathrow travellers and all Londoners for many years. Waterloo Cars is alot cheaper than London traditional Black taxi. Whether you are travelling from Heathrow to Central London or even going to any part of United Kingdom, we will not be beaten on price and service.